The company Jeep presented in Geneva in the spring of 2014 a new model of a miniature crossover called the “Renegade” and competing with the Nissan Juke. The novelty has caused considerable interest and surprise, because it turned out to be completely atypical for the manufacturer of off-road vehicles from America. The name of the model is also quite original. “Renegade” in English means “renegade”, “defector” and even “traitor”, so more than one automotive critic managed to go through the name, suggesting that American marketers thus hint at the Italian origin of the model. The novelty was developed in close cooperation with Fiat. Moreover, simultaneously with the Renegade, the production of the Fiat 500X model will be launched on the same platform, and Jeep Renegade going to the Fiat factory in the Italian city of Melfi. So is it really a little Jeep, or is it more Italian than American? The crossover is seen as a global model that will be sold worldwide. Designers have tried to develop for the model appearance that best meets the glorious image of American SUVs. Continuity is felt in everything: crossed lights stylized as a canister during the Second World War (this cross is also beaten in the logo), short overhangs, proud “Since 1941” inscription located above the glove compartment; highly recognizable profile of the legendary great-grandfather "Willis". I must say that the live machine looks much more interesting than in the photo, and most importantly, the Jeep is recognized in it in any light and from any angle. The crossover is assembled on the SCCS platform, which is the basis for the popular Fiat 500L SUV, whose crash test determined the car to be extremely reliable. It is also the basis of the Fiat Grande Punto, so it’s difficult to call this chassis ultramodern. But the main thing - "stuffing." With the "stuffing" in the new crossover no problems. 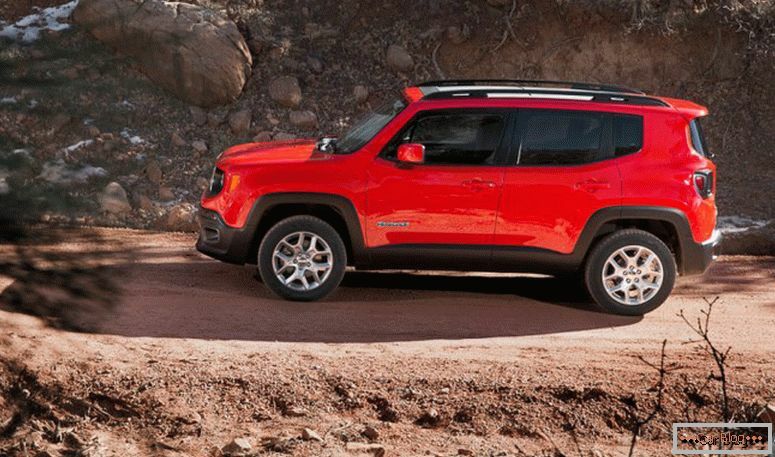 The length of the Renegade is 4,232 mm, the height is 1,689 mm, and the width is 1,803 mm. The wheelbase of the machine is equal to 2,570 mm. From 200 to 224 mm is the ground clearance of the crossover, depending on the modification - an impressive result. If we add to this the depth of the ford to be overcome (480 mm), it turns out that the manufacturers of Renegade are not exaggerating, claiming that they have created one of the most passable cars in the class of compact crossovers. By the way, the Americans remade the platform, shortening the wheelbase by 45 mm. The rear suspension has also changed: the Fiat 500L is semi-dependent, based on its levers, connected by a beam, and Jeep Renegade 2015 McPherson racks installed in front and rear. This is done in order to increase the suspension travel. And 205 mm is an indicator quite worthy of other ATVs! 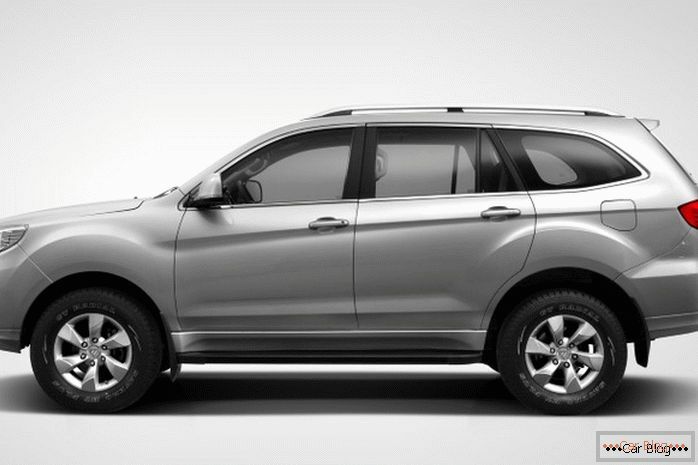 The front of the crossover is equipped with head optics, which has classic round shapes. Also characteristic is the design of the grille - here we see seven vertical slots branded, complemented by chrome trim. The image of a true SUV is complemented by a powerful bumper made of impact-resistant plastic with integrated fog lights. Swollen wheels, a completely flat roof surface, a solid plastic body kit to protect against damage to the lower part of the body (the hump on the hood serves the same purpose) all add to the model’s seriousness. Also, the adult form of the compact crossover gives it aft. When looking at the new model from the rear angle, once again I want to mention the skill and professionalism of the company's designers. 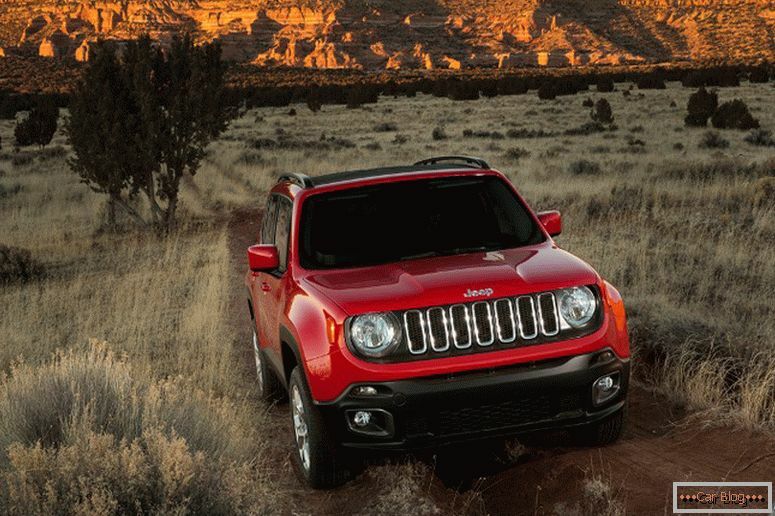 The body feed of the Renegade effectively underlines the serious image of a small crossover. Accented vyshtampovki rear wheel arches, originally flowing into the surface of the tailgate, immediately draw attention to themselves. This design decision gives extra massiveness to a small body. The tailgate is very practical, which ensures the correctness of its shape, ensuring convenience and comfort during loading and unloading. When buying, it is possible to order a model in an even more off-road version. Version Renegade Trailhawk has a 220-mm ground clearance, the original alloy wheels, shod in a special rubber 215/65 R17. This off-road version of the model is equipped with special tow hooks and trimmed rear and front bumpers to increase body patency. The entry angle at Trailhawk is 30.5 °, and the exit angle is 34.3 °. The ramp angle of the car is 25.7 °. Well, as already mentioned, the modified version of the model can overcome the ford depth of 480 mm. There is a Jeep Active Drive Low system, which is controlled by selecting a type of road surface using Jeep SelecTerrain. The driver is offered five modes: Auto, Sand, Snow, Stones and Dirt for the greatest efficiency of movement on any kinds of roads (if they exist at all). So Renegade, despite its status and size, can get where many competitors and are afraid to stick their nose. There is one more feature. 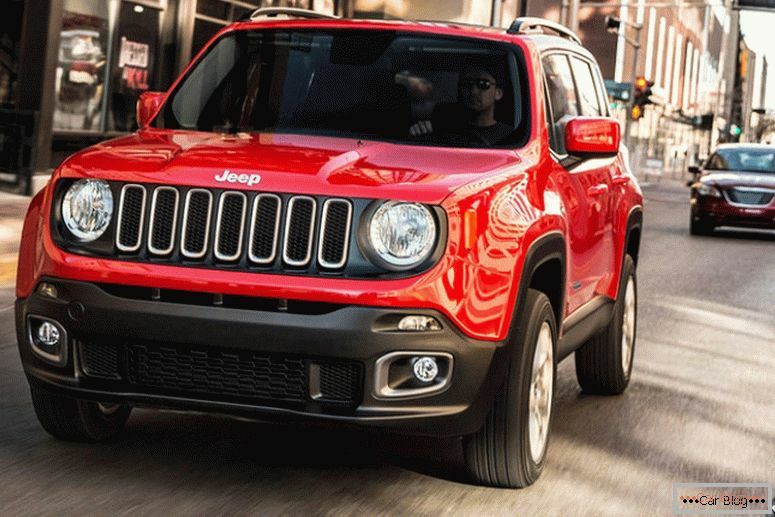 Renegade is the first car in its class with the ability to turn off the rear wheels, which gives fuel efficiency when driving on ordinary roads. The whole appearance of the novelty emphasizes that it was created for movement in conditions of bad roads and in those places where there is no asphalt, even if a particular model does not have all-wheel drive. This is a classic SUV, and not the usual "female" SUV, which is becoming more and more every year. Recommended article: Tuning Ford Sierra must do. Although the length of the car body is small, the crossover interior pleases with its volume. Comparing Renegade with the main rivals in the class - Peugeot 2008, Kia Soul and Nissan Juke, it becomes obvious that there is clearly more air in the Jeep cabin. In terms of the effective volume of the salon model corresponds to 3 356 liters. The flat roof, in combination with straight body panels, gave car designers the opportunity to create a roomy and comfortable interior. The trunk of the car has a volume of 350 liters. If you remove the rear seats, then the indicator of the volume of the load may increase to 870 liters. To transport items longer than 1.5 m, it is enough just to tilt the back of the front seat forward until it stops. The front seats are characterized by the presence of rollers of the lateral support of a small size and a very comfortable fit. They can optionally be equipped with electric heating. At the front of the car is one architecture with the Italian Fiat 500L. However, the interior of the “Jeep” was completely independent. The classic instrument cluster is two round traditional speedometer and tachometer scales, and between them is a rather large multifunctional color display. On him, the driver can display almost any data from the onboard systems of the crossover that interest him. Readability and informative display is characterized by the highest rates. The center console is decorated with a touch screen of modern multimedia complex Uconnect. The diagonal of this display (5 or 6.5 inches) depends on the model configuration. A picture from the navigation system map, rear view camera, as well as the functionality and graphics of the audio center are projected on the screen. Directly below the display is the climate control unit. The interior of the crossover is of excellent quality materials used for decoration and original design. Modern body color inserts look unobtrusive and stylish. The steering wheel fits comfortably in your hands. Sophisticated ergonomics of passenger seats and driver's seat allows you to enjoy comfort during long car races. The most complete versions of the car are equipped with a separate climate control system, a multitude of airbags, a high-tech innovation - the roof “My Sky”. This is an expensive, but very interesting and useful option. You can remove from it two panels of fiberglass and put them in the trunk, opening the sky for passengers both front and back row. In addition, the crossover has a number of safety systems and electronic assistants for the driver, including a system that prevents the threat of a collision and includes a system for tracking the so-called "blind" zones. The question that most motorists really care about is whether it will be offered for a novelty. Jeep Renegade 2014 price less than a million, or she jumps over this psychological mark. I want to believe that the modest size of the car with all its rich equipment will become an outweighing factor in the formation of prices. According to the roughest primary forecasts for Jeep Renegade price still be in the range from 700 to 800 thousand rubles. 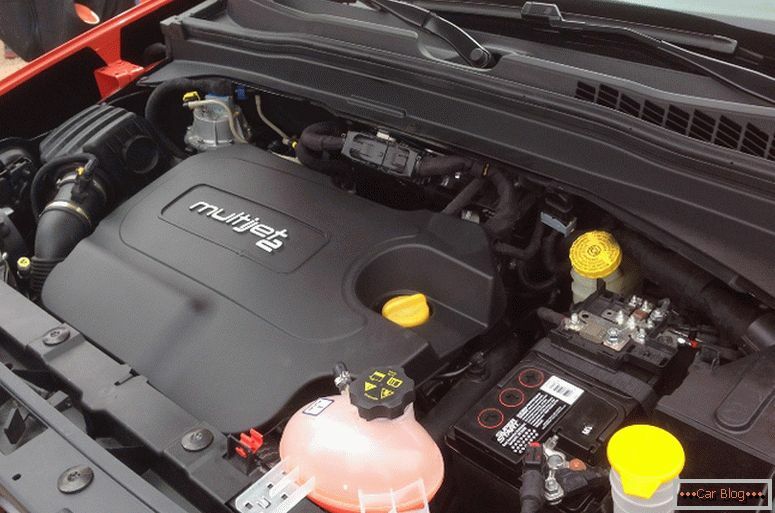 Recommended article: Diesel SUVs are beneficial in operation. Depending on the market, the car can be equipped with a five- or six-speed manual gearbox, a 6-speed robotic gearbox equipped with a double clutch or an innovative 9-speed automatic unit. The range of engines is no less varied. Jeep Renegade is characteristic which are presented below. 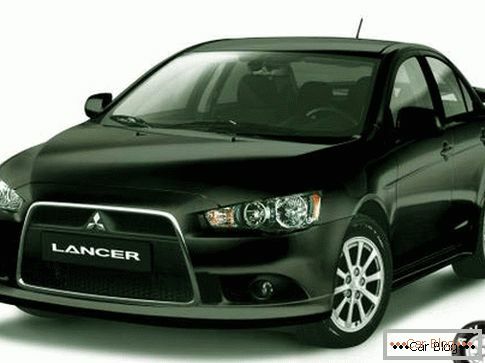 You can order for the car one of the four available gasoline engines and three diesel engines. It should be noted that a start-stop system is available for any of the presented engines, which allows saving up to 10% of fuel. As a result, it should be noted that the car was very successful. 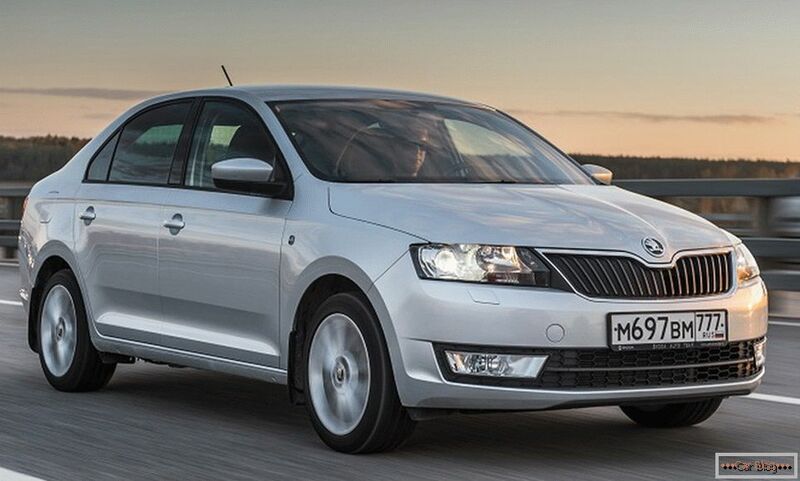 Despite its compactness, the car even with front-wheel drive will not disappoint either on the snow-covered streets or on the dirt road outside the city. When choosing a version with all-wheel drive, the buyer can be sure that he is sitting behind the wheel of a car capable of overcoming the most serious off-road. 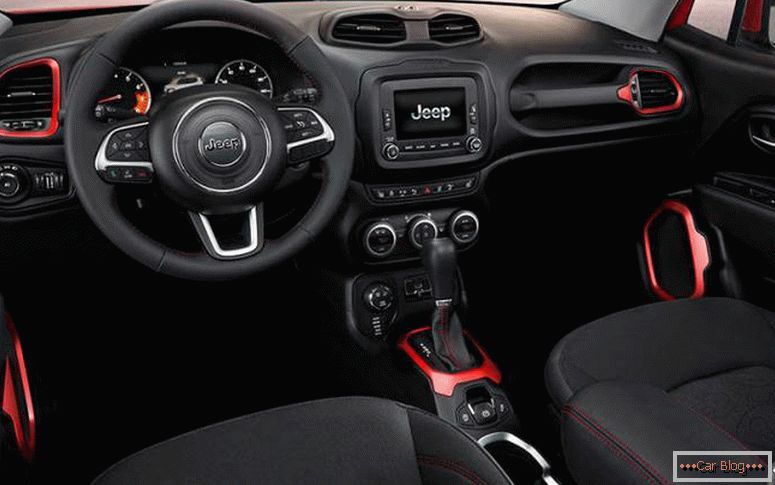 In combination with the comfort of the cabin, stylish interior and serious off-road appearance of the car, Jeep Renegade 2014 It is the best option for those who need a functional, modern and practical car, which is good for movement both in urban and off-road conditions. Among the shortcomings of the model, it is possible to note, first of all, rather uneconomical engines with which the new one is equipped. After all, even a diesel engine with a power of 120 hp. requires a combined cycle ride about 11 liters of fuel. Yes, and off-road exterior design can play an unkind joke with the manufacturers of the model, since the fashion for glamorous urban crossovers is now in full swing. Although it is, as they say, a matter of taste.